What’s the biggest mistake new online poker players make? If you answered not incorporating the right poker tournament strategy or poker cash strategy at the tables, you’re wrong. Sure, it’s important to know all that, but what’s way more important when you play online poker is proper bankroll management. A poker bankroll is the amount of money you’ve set aside to play poker. If you’re a member of an online poker site, you’ve got money on the site. That’s your bankroll. Ideally, you should set a monthly deposit limit and never go above that. If you’ve ever played at a casino, you might have been tempted to take what’s in your wallet and drop it down on the felt at the Blackjack tables. While this might be an OK approach for a night out, if you want to be a successful online poker player, the smartest poker strategy you can implement is bringing the right amount of money to the table. How much you bring to a specific poker table depends on what you’re doing. Today we’re going to explore various games to show you what’s appropriate and what’s not. If you’re sitting down in a tournament that offers a big prize pool, like the $25k or $50k guarantees you might see at various online poker sites, you can follow one poker tournament strategy to make sure your money lasts. Make sure you have at least 50 buy-ins available in your bankroll. So, if the buy-in for the tournament is $2, make sure you have a bankroll of at least $100. The best way to calculate this is to divide your bankroll by 50 and make sure you’re not entering a tournament with a buy-in larger than that. So if you’ve got $500 to your name, feel free to enter tournaments with buy-ins of $10, but not more. These tournaments are smaller and faster than MTTs. For Sit & Go tournaments, we recommend you come to the table with a bankroll of at least 30x the buy-in. So someone with a $300 bankroll can afford Sit & Go buy-ins of $10 or less. This is a smart poker tournament strategy to follow, but if you really want to be conservative, you can apply the multi-table tournament bankroll strategy here, too. The poker cash strategy you should use at cash games in terms of proper bankroll management depends on the table limits. When you play online poker, you can sit down to play at tables with $0.02/$0.05 blinds. Or you can play at tables with $0.50/$1 blinds. Someone with a $100 bankroll might be tempted to choose the latter, but doing so is incredibly dangerous. You could blow through your bankroll pretty quickly. The smart thing to do is look at the buy-in. At most online poker sites you’ll be asked to buy in to a cash table. Take a look at the table and make sure you’ve got at least 10x that amount. At a $0.05/$0.10 table, the buy-in might be $10, so you’d need $100 to cover that. For a $0.50/$1 table, you’d likely need to buy-in for $100, which means your bankroll should be at least $1,000. 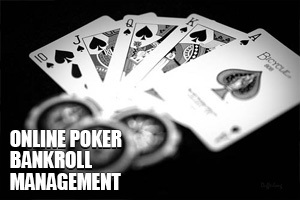 When it comes to poker tournament strategy and poker cash strategy, smart bankroll management can go a long way. Not only does proper bankroll management allow you to bet smarter and play more games, but it also lets you maintain a cool head as you play. Knowing that being the victim of a bad beat won’t mean the end of your game will make you feel like a champion, no matter how you do.